Admin Report Kit for IIS (ARKIIS) is a powerful reporting tool for Microsoft IIS Administrators. ARKIIS presents IIS configuration information from the IIS Metabase in the form of Trees, Tables and Views. All categories of information reported by ARKIIS are available across web servers and websites. This means that information may be viewed and reported for several web servers/sites in the enterprise simultaneously from a single server machine. ...... suited for efficient administration and reporting requirements, especially web servers that have a large number of websites, virtual directories and associated configuration settings. ARKIIS supports current versions of Microsoft Internet Information Server (4.0 / 5.x / 6.0) and localized versions of IIS, including German, Spanish and French. 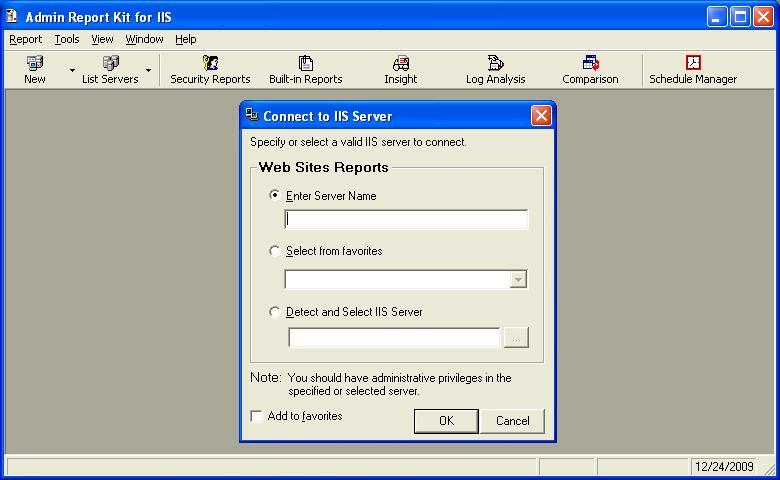 List IIS servers on the network - "List Servers" feature automatically detects all IIS web servers in the enterprise. Filter and Customize data - Powerful Filter and Customize options to track and report only the desired information. Export Reports - Flexible Export feature to export reports from ARKIIS to MS-Access database / HTML / Comma Separated Values (CSV) file format. Preview and Print Reports - Flexible print preview and print options to print the reports from ARKIIS to any local/network printer. ARK is a powerful reporting tool for the Microsoft Enterprise Network. PrinterAdmin Print Job Report is a tool for print cost analysis. Qweas is providing links to Admin Report Kit for IIS - (ARKIIS) 6.3 as a courtesy, and makes no representations regarding Admin Report Kit for IIS - (ARKIIS) or any other applications or any information related thereto. Any questions, complaints or claims regarding this application Admin Report Kit for IIS - (ARKIIS) 6.3 must be directed to the appropriate software vendor. You may click the publisher link of Admin Report Kit for IIS - (ARKIIS) on the top of this page to get more details about the vendor.